Here a process like filling the Canon CL-141 cartridge if you have additional questions write a comment, we will gladly help you. Canon Cartridge CL-141 ink pigment ink we can print about 180 pages when we, bought new original ink cartridge CL-141XL unlike some 280 pages printed using the same type of ink. In the standard version filled cartridge must put about 4 ml in each color ink, the ink cartridge version extra large (XL) it is necessary to 6ml of ink in each color. Unlike the process for black cartridge refill cartridges color it is a little more complex but no less easy, what could be called problem is to identify where the color cartridge. A very effective technique to identify the colors of the cartridge is going head east on a napkin or a piece of soft fabric that leave us injector signal that is every color. 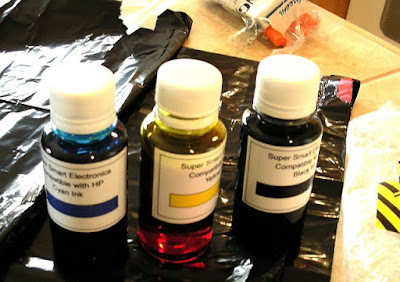 If not get pigmented ink can be filled with ink water-based, just know you will not have the same print quality, which is important is that you must use different syringes for each color, we can not use the same syringe to fill three colors. Before beginning this or any cartridge refilling it recommends doing this in an easy to clean surface or a cloth that does not mind black ink stain. Enter the amount of ink according to the cartridge you have, for example XL (Extra Large) the amount cartridges that have indicated at the beginning and likewise with standard cartridges version. This or any other cartridge must be filled with the top label that indicates the number of the cartridge, although properly know the position of the colors. The ink cartridges are easily evaporates if the cartridge labels drilled be damaged more easily. When we remove the top label of the cartridge, a small almost tiny holes will be, for these we must do everything possible to get the needle of the syringe. Please do not make holes in these cartridges with tools like drill bits for steel wall or the syringe has just the size that allows you to enter the cartridge. The ink cartridge is full when spilled some ink by the head, will have to do a little pressure to the ink inside the cartridge, which is why the recommendation to bring the cartridge on a surface you do not mind dropping some ink. When we put the ink cartridge can a little you have left by the head of the cartridge, it is recommended to clean these free ink, something important is not pass or touch the connectors of the cartridge, these are in the front and are some points making contact with the printer. After filling a cartridge always this process is recommended to ensure good impressions in case you can not or do not know the print head cleaning several test pages from the operating system of the printer. It will help if you do not want to leave the ink print a completely black page.